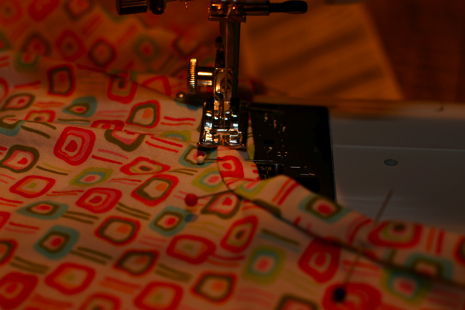 I stayed up late Monday night to whip up an original design for a pillowcase dress for this weekend’s craft column. This was my first attempt at a pillowcase dress, so I was totally winging it and praying something fierce. Thankfully, the little number passed the morning-after test and still looked okay to me in daylight. That’s the ultimate test. I can’t tell you how many times I’ve finished a project late at night thinking I totally rocked it, only to roll out of bed the next morning and be greeted by a craft disaster. Thank goodness this particular dress turned out okay. It’s nothing fancy, just a basic design that I hope people will use to help a local charity sewing group make clothes for needy kids in West Michigan. So, stop back here Sunday for links to the column and pdf instructions for the dress. On the Podcast front… I just recorded a lovely chat with Emily from “Inside A Black Apple” a.k.a. Etsy’s top seller. I plan to edit that up for a Sunday podcast release, so stay tuned! In unrelated news… Amanda’s book is finally out. It’s a must-have for any crafty mama, be sure to check it out. You can read my gushing review of it, then page through it yourself in your local bookstore. To hear the story of how her book came to be and more about her creative family life check out CraftSanity episode 60. “For the Love of Letters” Contest Winners…At Last!